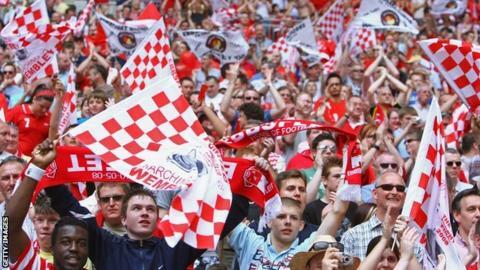 Football fans should boycott League clubs for at least one match in protest at high ticket prices, says an MP. Liberal Democrat president Tim Farron tabled a motion in the House of Commons following BBC Sport's 2012 Price Of Football survey. "I'd like to see people switch their allegiance to non-league clubs for at least one weekend," he told BBC Sport. The price of the cheapest average adult ticket in English football has risen by 11.7% over the last 12 months. Lifelong Blackburn Rovers supporter Farron said many football fans find prices "unaffordably high". In the wake of the BBC's survey, the Football Supporters' Federation warned that clubs were risking alienating supporters unless they lowered ticket prices. Malcolm Clarke, chairman of the federation - which represents about 250,000 fans in England and Wales - said a national boycott could be difficult to organise. "The BBC's excellent survey illustrated how the high price of watching football abuses the loyalty of spectators," he said. "We would be happy to discuss Mr Farron's idea of a national boycott although it's unclear how feasible that would be. "Meanwhile, we would strongly urge those supporters who can't or won't pay over-the-top prices to consider the idea of watching non-league football." For the second time this year, a Non-League Day was held earlier this month, during a weekend of international features. Its aim was to attract people to smaller clubs when no Premier League and Championship fixtures were scheduled. Farron said: "I would like to see a day of action where people punish their League club by going to watch a non-league club. "I'm not asking people to dump their club. I think fans should write a letter to their chairman, telling them why they are going to watch the other club." A Premier League spokesman declined to comment on Farron's suggestion. The MP, who represents Westmorland and Lonsdale in Cumbria, cites Chelsea and West Ham as examples of high pricing, where the cheapest matchday tickets cost £41 and £36 respectively. He believes supporting non-league teams, such as Kendal Town and Barrow, would "boost community football whilst also bringing collective consumer pressure on the top teams to reduce their prices". Farron's Early Day Motion is unlikely to be debated by MPs but is instead designed to attract attention to the issue. His motion reads: "That this House recognises BBC Sport's Price of Football survey 2012; commends the research into the various costs of going to see football at each club across the English, Scottish and Women's leagues; notes that the average cost of the cheapest adult ticket in the top four divisions of English football has risen by 11.7% in the last 12 months, which is more than five times inflation. "Further notes that the cheapest matchday ticket at Chelsea FC costs £41 and at West Ham FC costs £36 which is unaffordably high for many fans; and calls on honourable members to encourage people to go and see local non-League teams like Kendal Town or Barrow in the South Lakes, where ticket prices are 60-80% cheaper; and believes that switching to support non-League clubs will boost community football whilst also bringing collective consumer pressure on the top teams to reduce their prices."